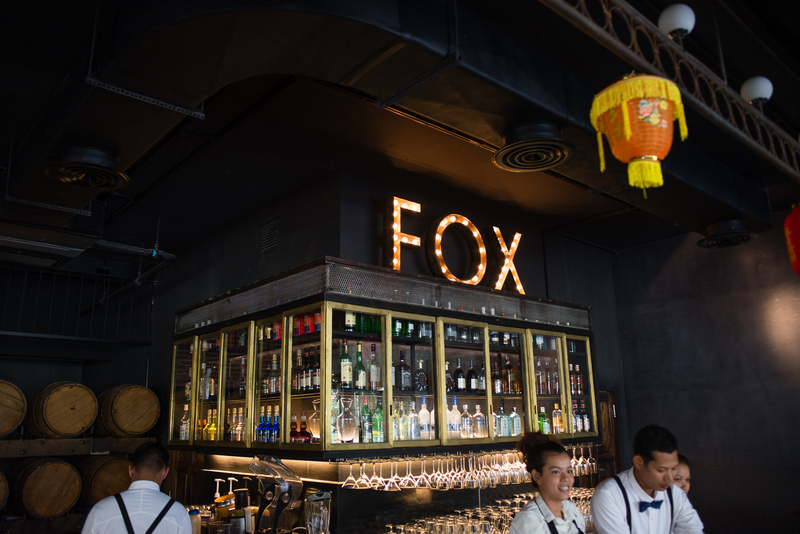 Fox is the latest offering by the entrepreneurs who brought Brown to Phnom Penh, and it has a lot of the same things going for it: well-trained staff, great interior spaces, and a mission to make Cambodian clientele feel at home in a typically Western setting. 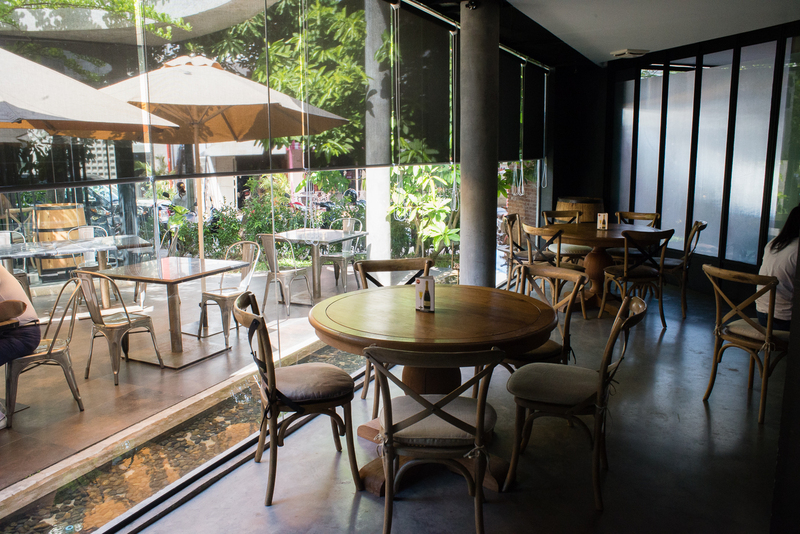 If you go, go at night; take friends or a date, enjoy the wine and the buzz of conversations in Khmer and western languages, and be open to some interesting Asian spins on the kind of dishes you find at Deco or Topaz. But OK, because we were taking photographs, Bryse, Anna, Peter and I went in the middle of the day one Saturday. It was kind of empty, and we didn’t have any wine, so we basically opted out of two of Fox’s top selling points. We also didn’t order any of the over $10 options on the menu. With those caveats, here are our thoughts on some of the dishes as we experienced them in the harsh, sober light of day. 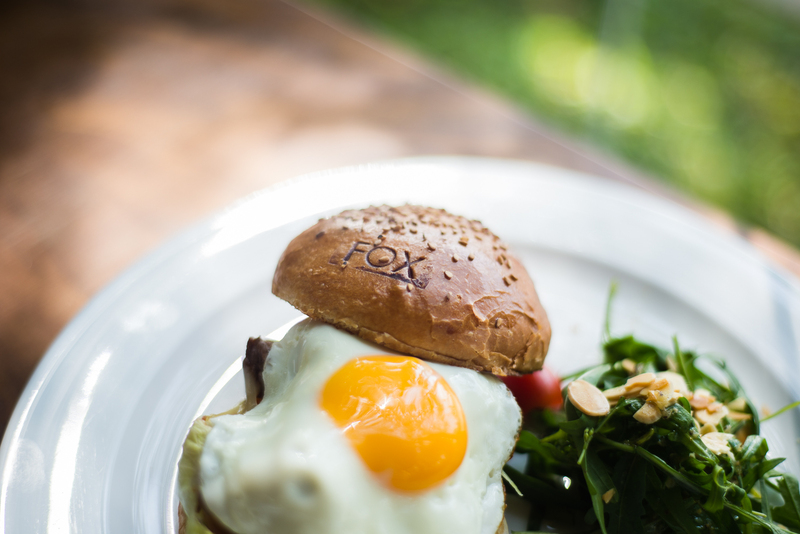 Fox serves a great-looking “burger”; well-toasted bun (complete with subtle “Fox” bun brand), sloppy egg on top, and with a decent side of wilted greens for a dash of healthiness. However, look under the hood and you’ll discover that this is not a standard ground beef patty, but rather, a small pile of saucy beef cubes. If I had ulterior motives, I could spin this as a groundbreaking Asian fusion burger, but to be honest, it was a little weird and disappointing, particularly compared to other Nyam Penh burger adventures. Also, where are the fries? For $6.50 or less, you can get way better, more traditional burgerage in Phnom Penh. The mini-burgers look adorable and taste pretty good. Unlike the regular sized burger, these have more traditional patty structure and texture. Alas, the truly delightful burger physics of juicy-centeredness and outer-crustiness are rarely found at this quantum level, and even as mini burgers go, these didn’t have that much meat. 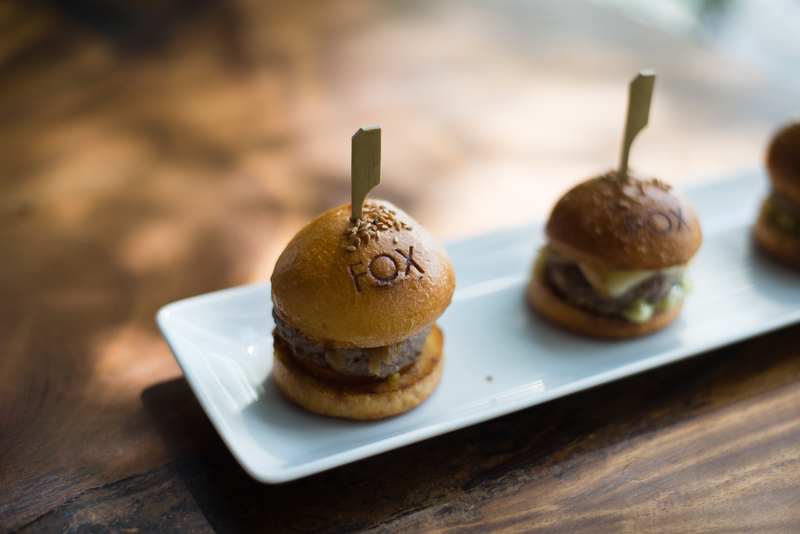 But Fox mini burgers, how can I look at Anna’s picture of your tiny Fox buns and write you off as not worthwhile? At $5-$6, they are not a bad choice for an appetizer. 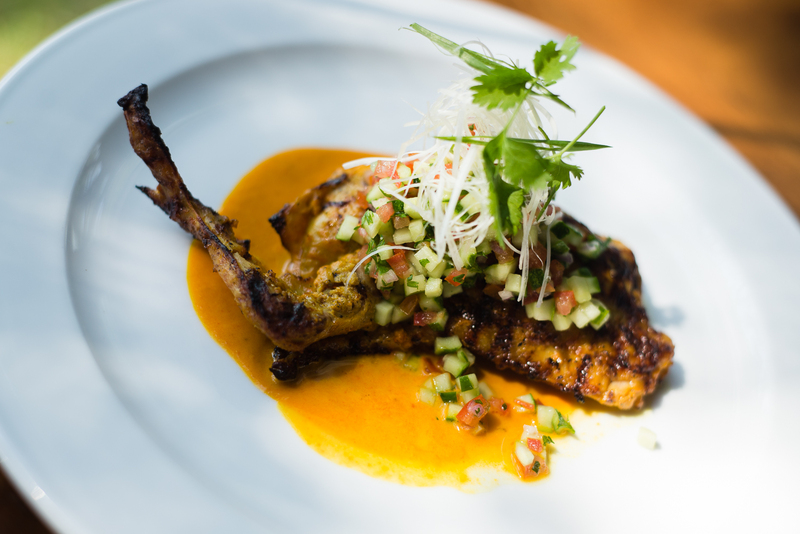 The chicken has a very Western presentation, and yet the flavors are all Khmer. The sauce reminded us of amok, with delicious notes of lemongrass. I could have used some rice, though; like with the “burger,” it seemed conspicuously carb deficient. It was particularly odd that it didn’t come with rice, since, according to the waitress, this is a dish designed for Cambodian diners who aren’t in the mood for our exotically ethnic food (“they say it is too bland,” she explained) and prefer something they’re used to. To a Westerner, on the other hand, it is a very intriguing take on a gourmet chicken dish. A little steep at $8, but worth a try. This is the goat cheese beet root salad with strawberries and walnuts. 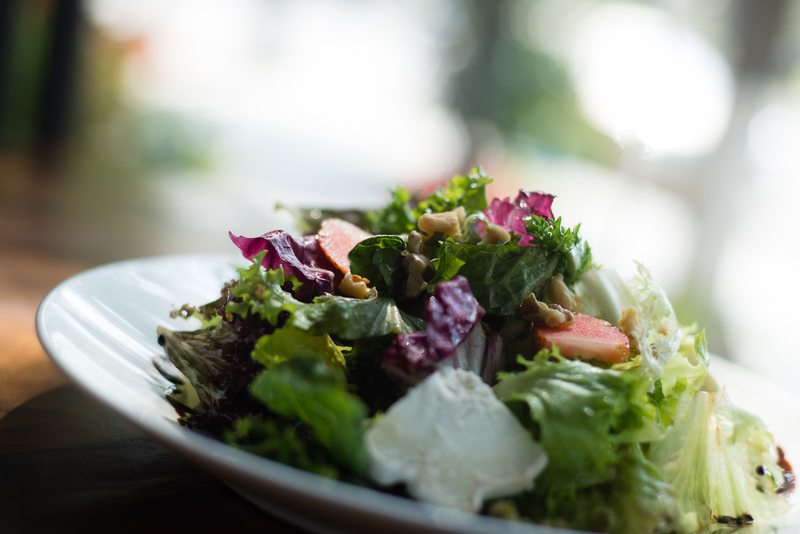 Unfortunately, there are only two slices of strawberries, very few beet roots, and not a lot of goat cheese — and the goat cheese, unfortunately, doesn’t have that crumble to its creaminess that usually makes goat cheese worthwhile, it was closer to standard cream cheese in blandness and texture. In addition to the vinagrette on the side, the salad leaves came already dressed in oil, making the whole thing unexpectedly greasy. For the above dishes, we stuck with the under-$10 options. Our waitress, who was very helpful and well-spoken, noted that the more expensive dishes (Australian rib-eye; lamb; etc) were the most popular, and I would spring for those next time I go back. And I will go back. Like I said at the top, it’s a good scene at night, and it’s nice to have a Western restaurant that really feels like it has grown up in the new, cosmopolitan Cambodia.